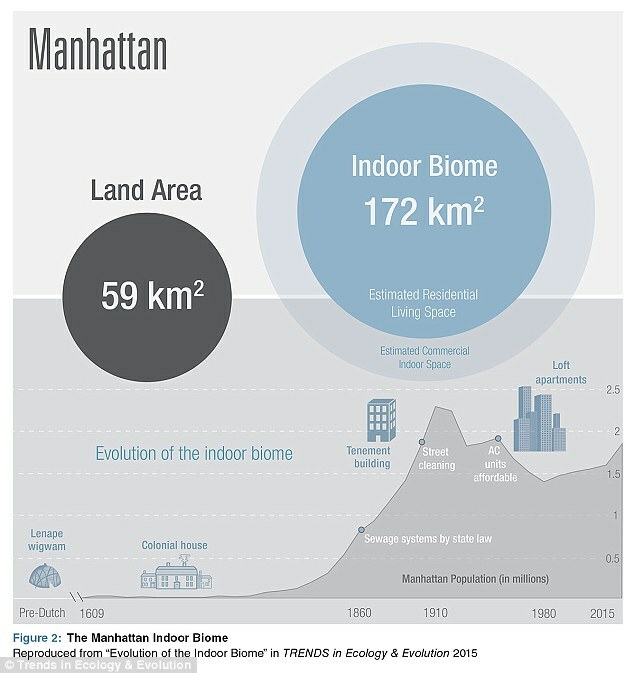 A new paper “Evolution of the Indoor Biome” is out and should be of interest to many who think about microbes in the built environment and related topics. The paper has quite an incredible collection of authors: NESCent Working Group on the Evolutionary Biology of the Built Environment, Laura J. Martinl, Rachel I. Adams, Ashley Bateman, Holly M. Bik, John Hawks, Sarah M. Hird, David Hughes, Steven W. Kembel, Kerry Kinney, Sergios-Orestis Kolokotronis, Gabriel Levy, Craig McClain, James F. Meadow, Raul F. Medina, Gwynne Mhuireach, Corrie S. Moreau, Jason Munshi-South, Lauren M. Nichols, Clare Palmer, Laura Popova, Coby Schal, Martin TÃ¤ubel, Michelle Trautwein, Juan A. Ugalde, Robert R. Dunn including some of my favorite people in the field. -We review literature on evolution in the indoor biome. -The indoor biome is an expansive and expanding habitat. -Study of the indoor biome combines evolutionary biology, ecology, architecture, anthropology, building science, and human ecology. -Studies of the indoor biome are well suited for citizen science projects, public outreach, and large-scale international collaborations. Few biologists have studied the evolutionary processes at work in indoor environments. Yet indoor environments comprise approximately 0.5% of ice-free land area — an area as large as the subtropical coniferous forest biome. Here we review the emerging subfield of ‘indoor biome’ studies. After defining the indoor biome and tracing its deep history, we discuss some of its evolutionary dimensions. We restrict our examples to the species found in human houses — a subset of the environments constituting the indoor biome — and offer preliminary hypotheses to advance the study of indoor evolution. Studies of the indoor biome are situated at the intersection of evolutionary ecology, anthropology, architecture, and human ecology and are well suited for citizen science projects, public outreach, and large-scale international collaborations. Mark Prigg in the Daily Mail 3/26: The average house has 8,000 different types of bacteria and bugs | Daily Mail Online. The paper came out of a 2013 workshop that included the evolutionary biology of the built environment, which included evolutionary, microbial and plant biologists, entomologists, architects, scientists who study better building design, and others. ‘The radical diversity in abiotic environments, such as in water heaters, freezers and on kitchen counters, is vast and could parallel microclimates found on forest floors,’ said Martin. Evolution of the Indoor Biome — new review paper in TREE . This is an important paper, a nice piece of work of collaboration by many members of the community. However there is one aspect of the paper with which I have concerns. This is the choice by the authors to publish it in an non open access manner. The paper costs $37.95 to purchase and as far as I can tell is not freely available anywhere on the web at this time (I spent a lot of time looking). I believe this paper would have generated attention and interest no matter where it was published and thus the choice to publish it in TREE in a non open access manner was unwise. The lack of openness is disappointing, especially in light of the potential relevance to the public and citizen science as such as the authors even mention in their abstract “Studies of the indoor biome are situated at the intersection of evolutionary ecology, anthropology, architecture, and human ecology and are well suited for citizen science projects, public outreach, and large-scale international collaborations.” I hope that these authors when they publish in the future will consider access to the paper and the openness of the paper to be key components of outreach and scientific communication. Authors of the paper tell me the paper will be made open access — there is just a slight delay in getting that set up. Yay.